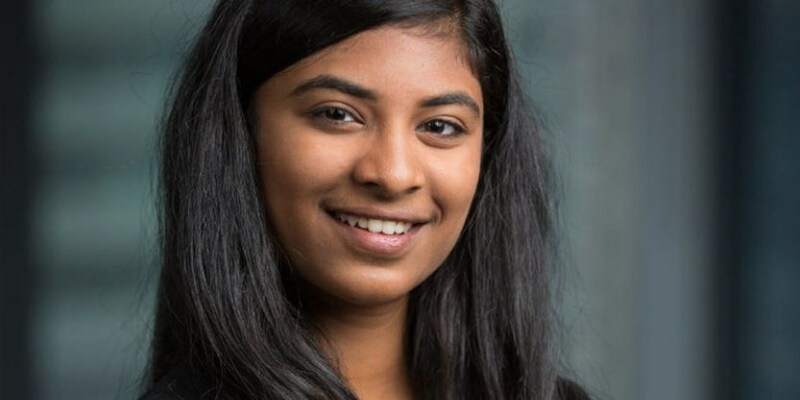 Riya Karumanchi, a student who will start high school next week, spent the summer perfecting an invention she hopes will improve life for the blind and visually impaired community: A "smart cane" that vibrates to alert users of objects in their path. She came up with the idea for her smart cane after a chance encounter at a friend's house. Her friend's grandmother, who is visually impaired, happened to be visiting and inspired Karumanchi to do something to help. Abby Kircher has always loved peanut butter. But at age 16, when she started making an effort to eat healthier, she realized that many peanut butter brands are loaded with sugar and oils. She didn't like the plain almond butters on the market, so she decided to create her own nut butter, something that was healthy, naturally-sweetened, and tasted good. Two years later, Abby's Better Nut Butter is being sold in grocery stores across North Carolina and Tennessee, and Kircher is hoping to make her nut butters available nationwide soon. For teenage entrepreneur Zandra Cunningham, it all started with a love for lip balm. With an insatiable desire for more, Zandra's father suggested she make her own—and that, fellow teens—is how this Buffalo, NY-based entrepreneur started her own handmade lip balm line at the young age of 9. Fenu Health, horse health company started by Annie and Kate Madden, achieved second place for their entry at the 2015 Young Scientist & Technology Exhibition in Dublin, Ireland. The sisters from Co Meath grew up around horses, and their project was based on encouraging horses to eat by adding various flavours to their feed. A congratulatory phonecall from Michael Connolly of animal feed company Red Mills led to an invitation for the sisters to attend Equitana, the world’s biggest equestrian fair in Germany two weeks later. AT 14 years old, a schoolgirl started asking a friend living in France to send her designer handbags to sell on eBay. Holly Cardew paid warehouse prices of less than $100 for the Longchamp bags before flogging them to Australians at a fraction of what they cost at David Jones, and still making a tidy profit. Holly is now 29. Read her inspiring story. 'Ever since I was 12, my dream was to open my own dance school'. Now 17, She's Got It !! Lacey Koughan loves to dance so much that she decided to open her own dance school. Last week, just before turning 17, Koughan waltzed down to the provincial building to register her new business, 24 Dance. She's starting small: for now, she's using space at Kitnetic Fitness to teach a few classes. "My backstory and inspiration is, in 2008 my dad was diagnosed with Type 2 Diabetes. This was very upsetting news for our family, but it was also the event that helped turn our family on to healthier eating and overall lifestyle habits. It took 4 years, but happily my dad's diabetes has been reversed, and our family now enjoys a much healthier plant-based lifestyle...."
Angered by the suicide of an 11-year-old cyberbullying victim she’d never met—and the sting of electronic insults she’d received—Prabhu decided to try to stop the abuse at its source. The 15-year-old’s invention, ReThink, a computer software program that urges potential bullies to think twice about their actions, has the potential to curb the harassment that affects millions of young people each year. At age 17, Jannelyse Allred, of Mapleton, has a thriving business. She bakes eight varieties of bread for the Mapleton Farmers Market and has done so for a couple years. She has a food handler’s permit as well as a cottage kitchen permit. Two women took the stage and introduced themselves: Mackenzie Barth and Sarah Adler, the founders of Spoon University, the company that brought everyone together that day. One look at the two — both 24 years old and recent college graduates — and it was clear that Spoon, an up-and-coming player in the food media world, isn’t your grandma’s publication. The 10-Year-Old Girl Boss Behind the "Love Sandals"
Abi Smithson set out to make sandal tan lines an accessory, rather than an unattractive side effect of summer. With help from Robert Ott from Ryerson University and David Bensadoun of the Aldo Group, the Love Sandal and heart-shaped tan line were born. Nearly every driver has experienced that wave of exhaustion, where it becomes almost impossible to stay awake at the wheel. While 14-year-old Katherine Wu is too young to have experienced this situation firsthand, she noticed how difficult it was for her dad to remain alert while driving back from their family vacations in Florida to their home in North Potomac, Maryland. Her mom would talk to her dad to keep him awake to prevent an accident. On the surface, 18-year-old Jordana Gotlieb may seem like a typical high school senior at Milken Community Schools in Los Angeles. She’s involved in sports — varsity swimming and varsity water polo — as well as high school clubs like the robotics club and the United Synagogue Youth. And, like many other seniors across the country, she’s eagerly waiting to hear back from colleges — particularly the University of Southern California and Georgia Tech. But most other high school seniors can’t say they’ve successfully created a product designed to help the blind or visually impaired, entered it into numerous competitions and placed high every time. Teen Shelby Goglushi has a lucrative line of customized jewelry called snap and poppers. She keeps the line affordable so anyone can purchase them and her goal is to be on Shark Tank. Kritika Singh was only 16 when she founded Malaria Free World in August 2014. Malaria Free World is a non-profit organization aimed to raise awareness about the malaria epidemic and current malaria research efforts. The org has teamed up with global organizations like Harvard University’s Defeating Malaria Initiative and UN’s Nothing But Nets. It aims to save lives by partnering in global efforts to help people suffering from malaria or at risk of getting it. For 11-year old Kia‘i Tallett, living on a remote farm on the Big Island of Hawaii means you learn to make what you want to wear with your own hands.“We like to make things instead of buy them,” Kia‘i told HuffPost of her family. Her parents, artist Sally Lundburg and surfboard shaper Keith Tallett, encourage their daughter's creative process. A 14-year-old entrepreneur is set to become one of The Foundry's first graduates -- as she moves her growing bath and body business into the Pierce Arrow Commerce Park off Elmwood Avenue. The company, Zandra, makes organic soaps, sugar scrubs and lotions, which it sells directly over the Internet and at a variety of local retail locations, including The West Side Bazaar. Gabrielle Jordan is the owner of Jewelz of Jordan, a jewelry line she started at the age of 9 years old. Since then she has expanded her brand to include Gabrielle Jordan International which is her speaking and authorship business. Fascinating !!. Katelyn Lohr from Vancouver, British Columbia (Canada) is not your typical teenager. At age 13, she launched her own company, Freetoes Brand, Inc., to sell her invention: socks without toes, which are now sold across North America in stores like Toys R Us, Hallmark and Learning Express. Ketelyn's business has a charitable side which she takes very seriously. Remmi Smith, who has a show called Cook Tiime With Remmi, inspires children all over the country to live in wellness. Remmi’s Italian salad dressing is sold at Whole Foods Market and other specialty stores. She has also authored a cookbook, Global Cooking for Kids, which features healthy recipes from around the world. Remmi is the Student Ambassador for Sodexo, who serves her recipes in over 4,000 schools across the country. Remmi has partnered with national non-profit No Kid Hungry2 to help feed children in need. Meet Megan Grassell, the 19 year-old teen from Jackson Hole, Wyoming who started a company called Yellowberry which makes wholesome and age-appropriate bras for girls ages 11-15. It's an idea she had after taking her 13-year-old sister Mary Margaret shopping for her first bra and finding that all the options were ill-fitting and over-sexualized. In 2014, Grassell (currently 19) raised over $41,000 in a $25,000 Kickstarter campaign, and after a Lingerie Talk post about the campaign went viral, sold out of her first stock of product in days. Alissa Chavez of Albuquerque , New Mexico, ran a crowd funding campaign raise money to develop her invention to stop infant car deaths in hot cars. The campaign raised four times as much money as she was seeking – a testament to the strength of her idea and the need to solve the problem of hot car deaths. The device reminds parents when their child is in the back seat of a car by using a sensor. If you walk more than 40 feet from the car, an alarm will sound.